2008; 274 pages. Genre : Modern Literature; Historical Fiction. Overall Rating : A-. It's 1946 and World War 2 has recently ended. Juliet Ashton is a one-hit author (think Erma Bombeck) trying to adjust to a normal life after her London flat was flattened in the war by a V-2 bomb. She crosses paths with some of the inhabitants of the island of Guernsey (a British protectorate, located in the English Channel, and just off the coast of France) who are trying to adjust to a normal life after having been subject to German occupation for five years. 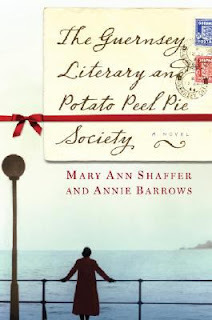 To cover their curfew violation one night, they invented the Guernsey Literary & Potato Peel Pie Society, which had the unforeseen benefit of introducing a bunch of the islanders to Classic Literature. It's a great epistolary novel. There's a slew of engaging characters, none of whom are "black & white" (not even the Germans), and most of whom evolve as the book progresses. There's wit throughout and even a subtle thread of humor underpinning the storyline. Like Rebecca, I liked the first half (where everyone is making acquaintances with one another) better than the second (after Juliet arrives on Guernsey). Like Julie, I had trouble keeping track of who's who. Especially the Londoners, all of whom seemed to have S's (how does one write that?) for initials. There was Sophie and Sidney and Susan; there was Stark and Stephens and Strachan. Sheesh. It's an ambitious book in that it combines the themes of the horrors of war, reading the classics, and ...oog... relationships (romantic and otherwise) into one story. It's hard to say who the target audience is. But I enjoyed it, I give it a high recommendation and an "A-" rating. Oh icky-ewwww! It has romance in it. True, but the main romance is between Juliet and the island of Guernsey. Julie, here at 5-Squared, here. Rebecca, at Rebecca Reads, here. Meagan, at Fifty Books Project, here. The Bradfords, at Strictly Letters here. On the afternoon before our wedding, Rob was moving in the last of his clothes and belongings while I delivered my Izzy article to the Spectator. When I was through, I tore home, flew up the stairs, and threw open the door to find Rob sitting on a low stool in front of my bookcase, surrounded by cartons. He was sealing the last one up with gummed tape and string. There were eight boxes - eight boxes of my books bound up and ready for the basement! "Juliet?". He really had no idea what I was talking about. So I explained. Feeling better by the minute, I told him that I would never marry him or anyone else who didn't love Kit and Guernsey and Charles Lamb. "What the hell does Charles Lamb have to do with anything?" he yelped (as well he might). So it looks like this one is getting good reviews all around. i didn't look at the Amazon reviews before posting, but i did read a number of blog postings. they seemed to range from "okay" to "great". Yeah, I think this is a book that has good in it. Hard for anyone to HATE it, I think. But I personally thought it was just okay. Hey I guess you do like romances, with inanimate objects!!! I liked the first half better too, mainly because I had a hard time buying Juliet's romance with Dawson, was it? "I guess you do like romances, with inanimate objects..."
strictly speaking, a Vampire is an inanimate object. Okay, okay, I'll concede that one to you. You and I might be the only people in the world that think that though. What is it about cold, dead, colorless corpses anyway? Oh, I have been wanting to read this! The title caught me at first, and I've heard really great things about it since. I can't tell you how many times I've *almost* bought it. So glad you read this and I enjoyed your review, Hamilcar. Misty - I've *almost* bought this too but I ended up checking it out at the library. I may consider getting it in paperback sometime. i found a used hardcover version of this at the bookstore for $14. i didn't like the price, but bought it anyway. instant gratification appeals to me. a couple hours later, we were at Sam's Club, who had the paperback, new, for $11. there's a lesson in there somewhere for me, probably having to do with *patience*.